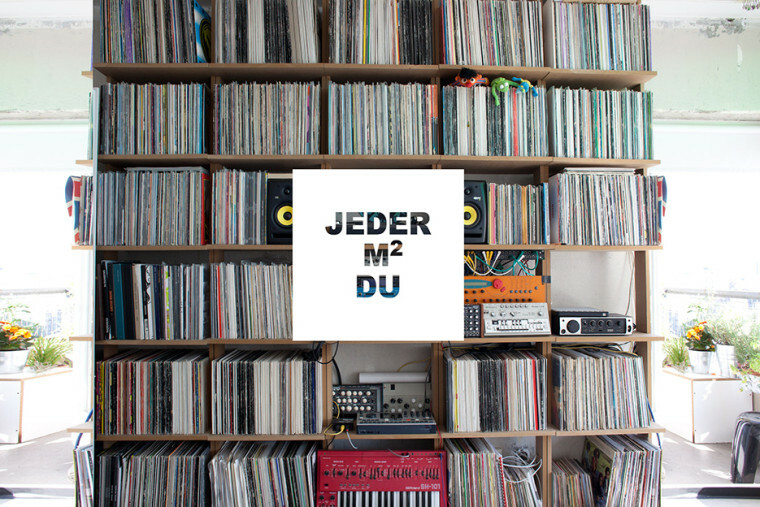 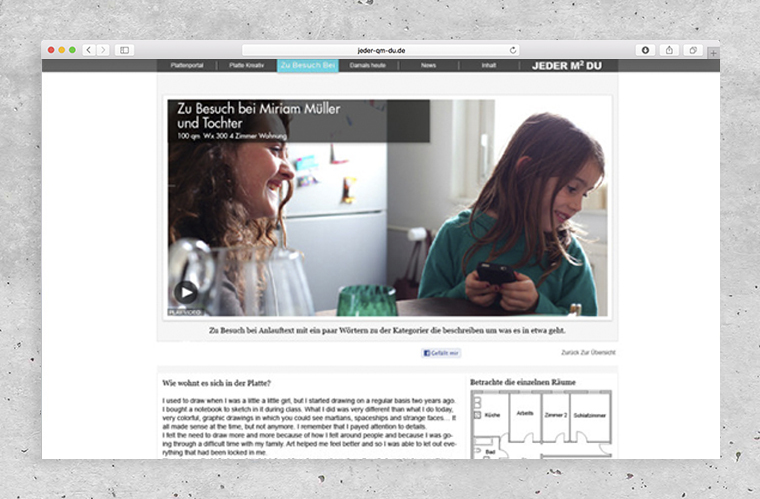 The first level page of the website “jeder-qm-du“(“every-sqm-you”) uses images to show the various sections on the page. 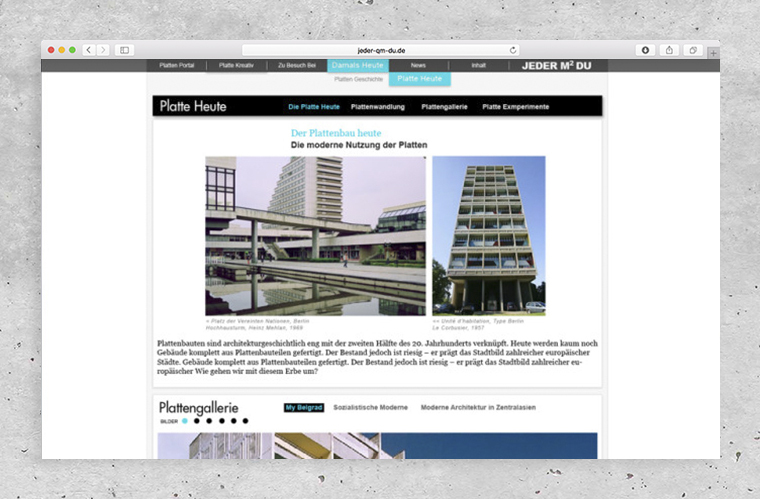 “Platte Kreativ“ (“Creative Prefab“) is dedicated to the creative use of the building material and the individual design ideas of its residents and proposes designs. 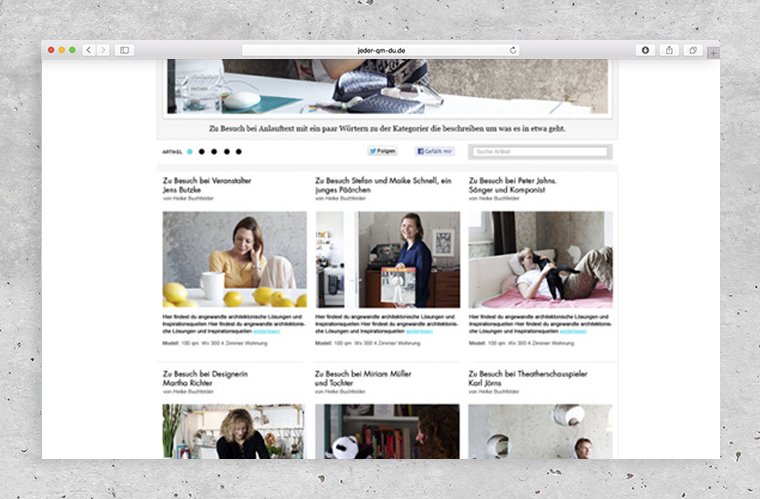 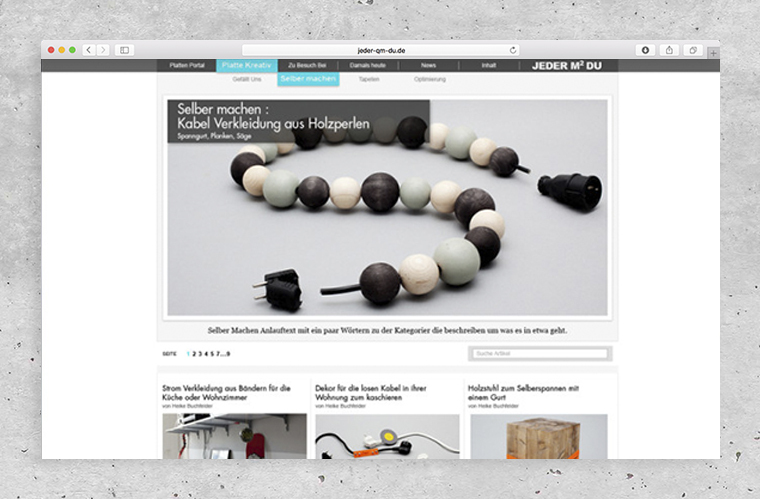 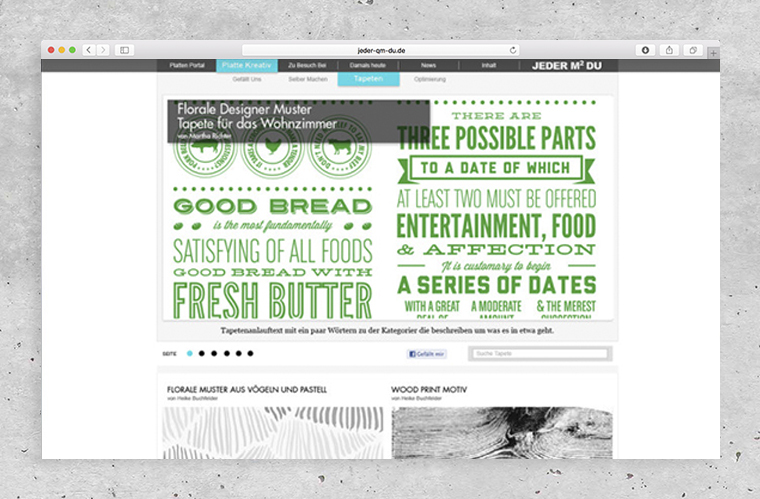 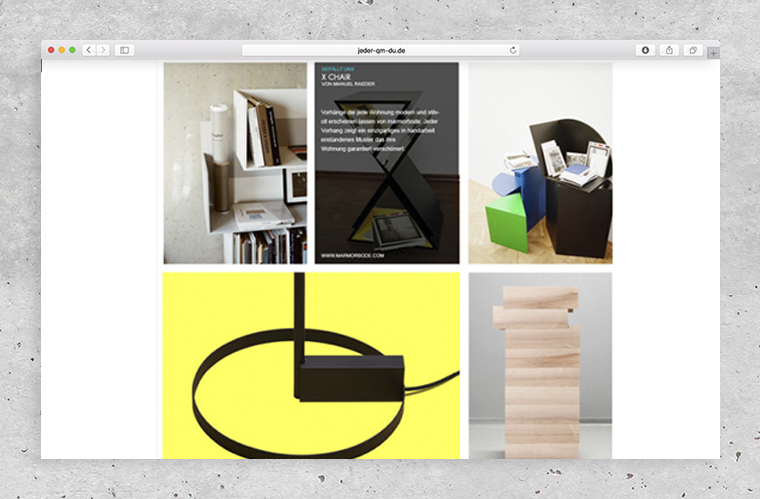 “Gefällt uns” (“We like it”) shows designer items, furniture and articles by young product designers. 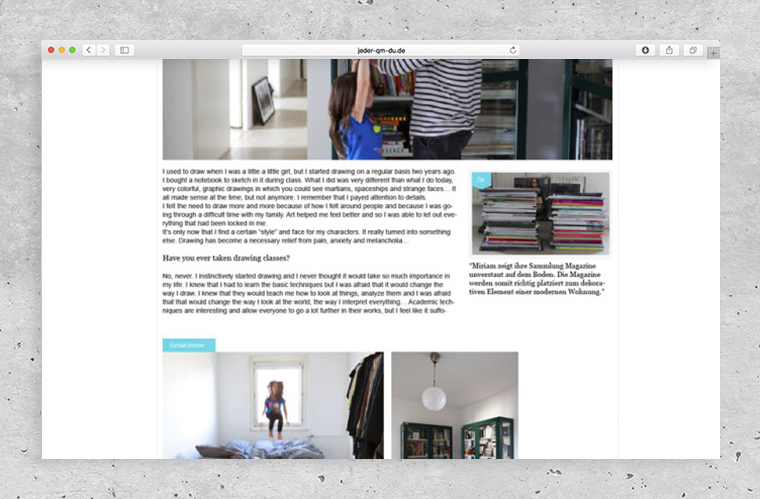 Designed in blog style. 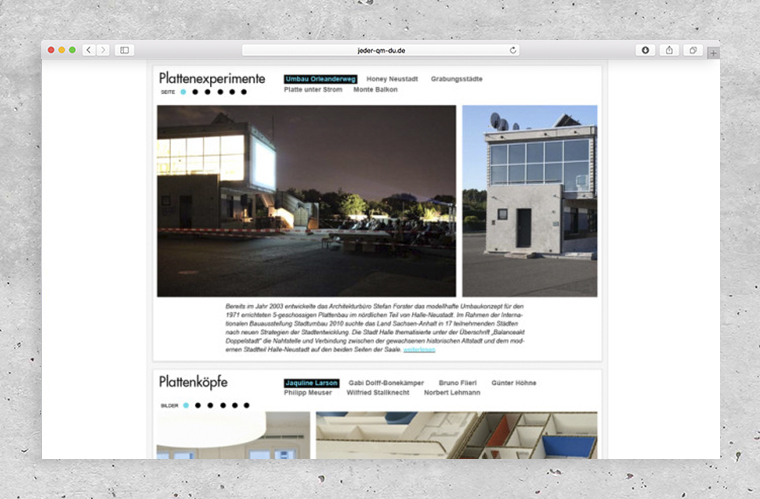 “DIY“ (“Creative Prefab“) is dedicated to the creative use of the building material and the individual design ideas of its residents and proposes designs. 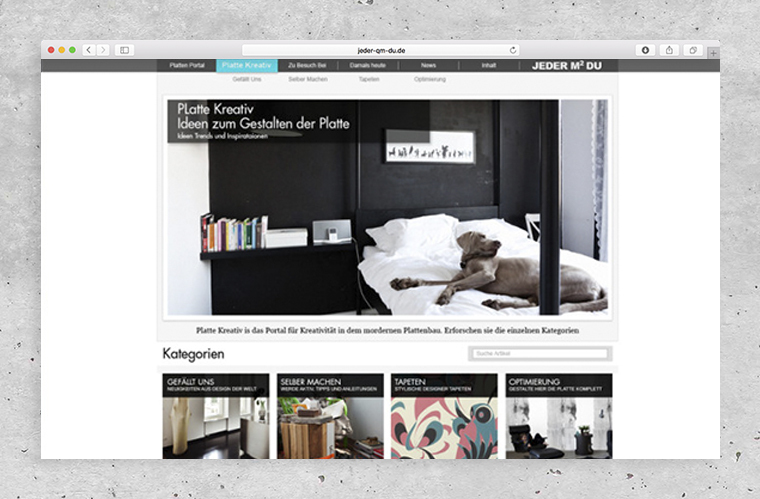 “Tapeten” (“Wallpaper”) shows a wallpaper collection specially created by young Berlin designers for the website and available for order. 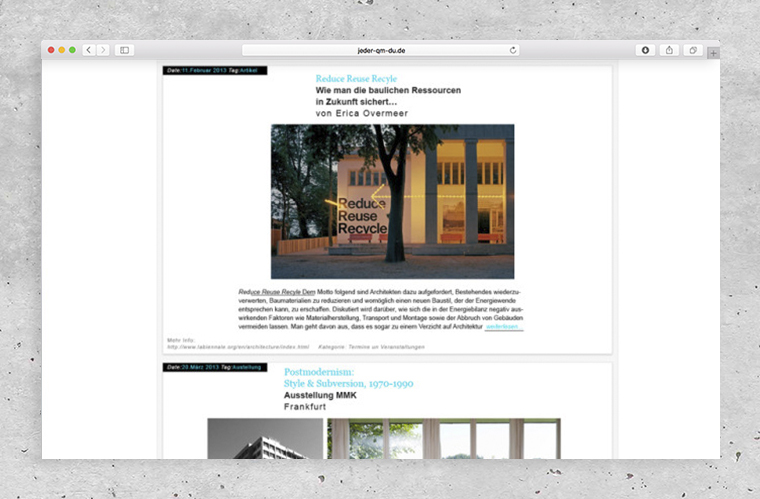 “Zu Besuch bei …” (Visiting …”) uses image galleries, videos and interviews to show the varied, stylish and creative the ways in which the Berlin people live in and furnish their prefab apartments. 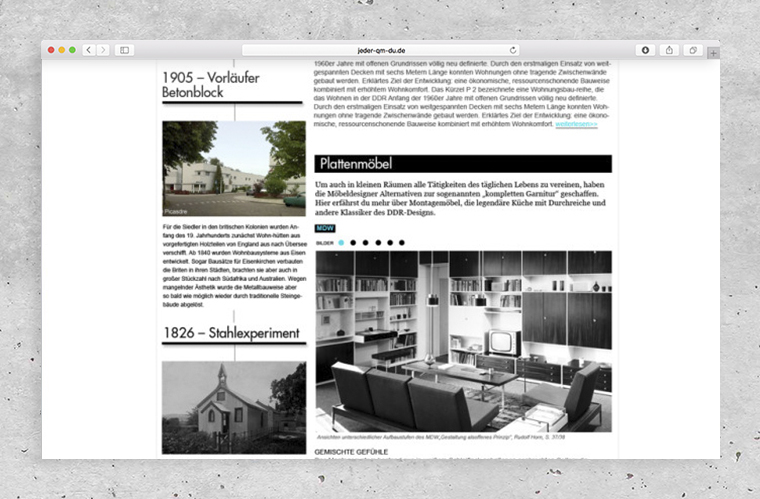 In the photo galleries, detailed images highlight some furnishing elements as tips and some of these are linked to the section “Selber machen” (Do it yourself”). 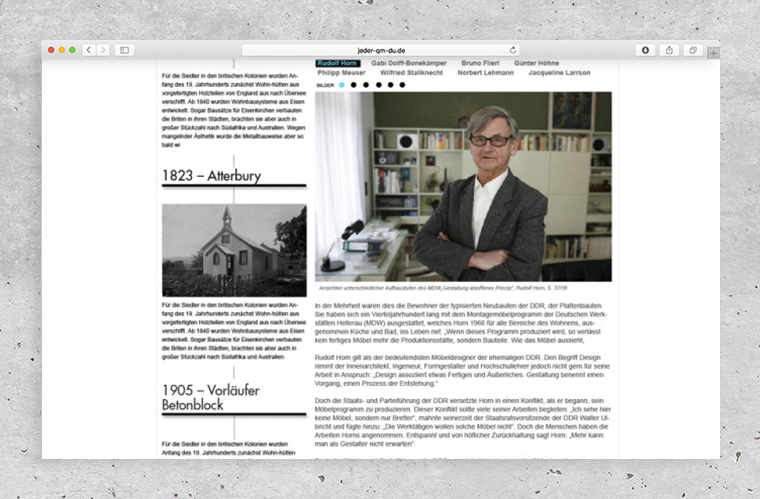 “Damals und Heute” (“Then and Now”). 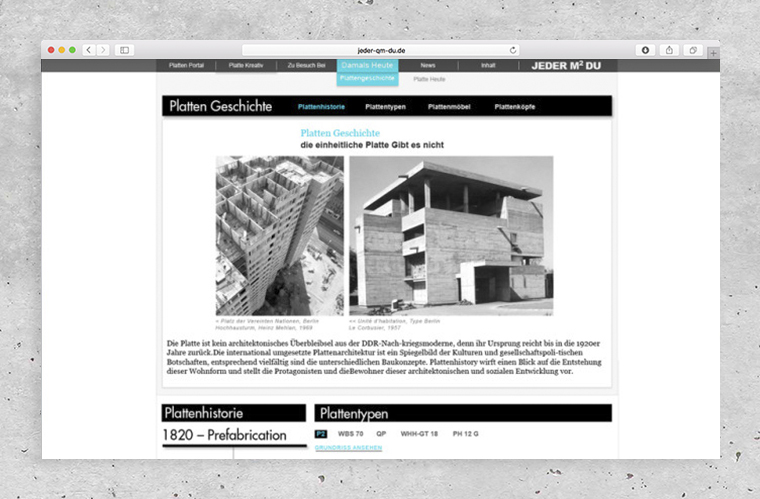 Dates, facts, images and documentary films tell the history. 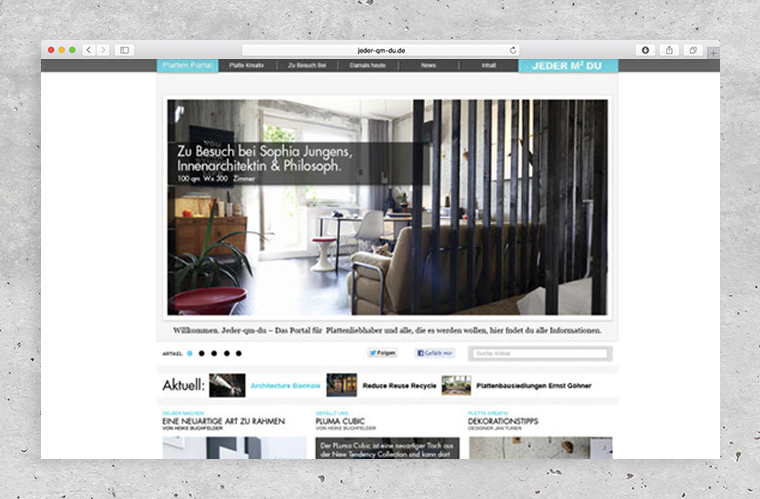 „Heute“ (Today) shows the transformation and modification of this kind of architecture. 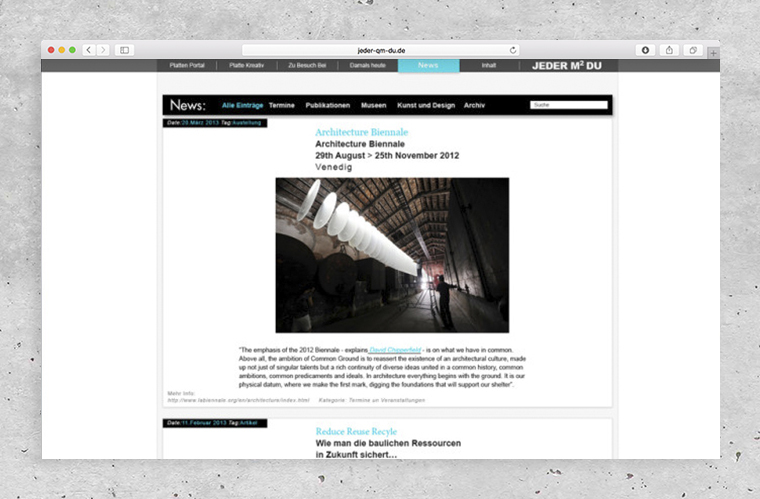 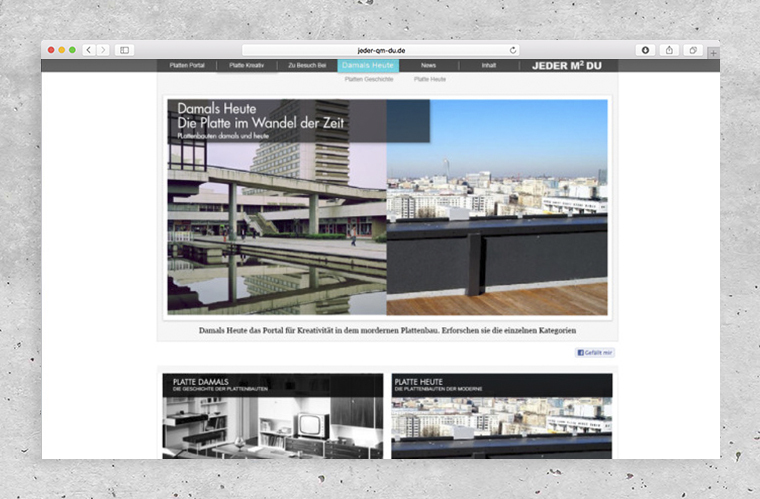 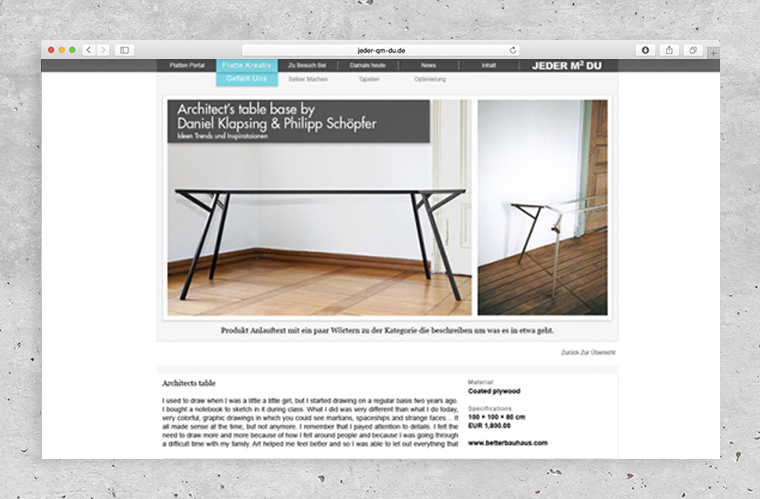 Provides information on events, publications and exhibitions about architecture and prefab apartments.